On the vernal and autumnal equinoxes the higher stone casts its shadow over a stone approximately 11.5m away. The animation shows 1) vernal and autumnal equinoxes (Height Model Equinox) as well as 2) the days before the vernal equinox and the day after the autumnal equinox (Refraction Equinox). See definitions in Days-of-the-calendar. 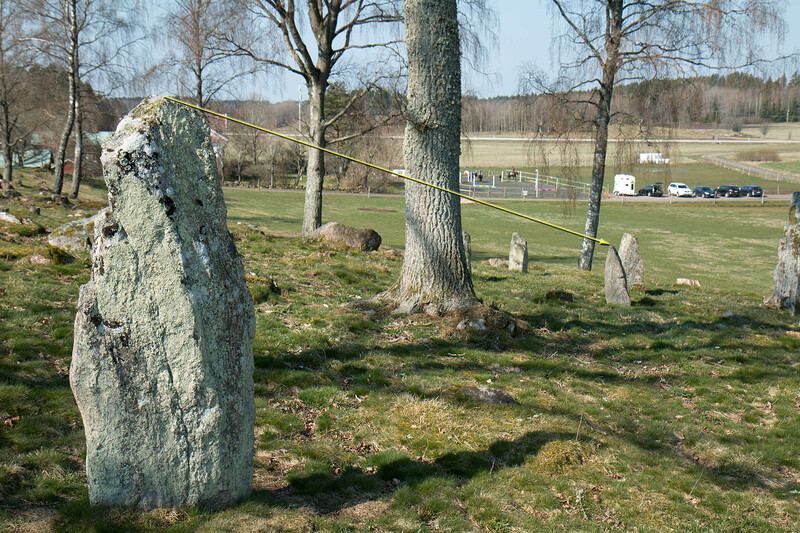 The gradient of the top of the two stones is in good alignment with the sun’s path. The shadow’s movement across the stone ends up just slightly low on the lower stone corresponding to about half a day on the day before the vernal equinox and the day after the autumnal equinox (“refraction equinox”). This is acceptable since the criterion set on the maximal deviation is a half day. It is possible to see the sunline, even if the shadow’s passage does not fall quite right because of the lower stone’s tilt. In 2014 this will take place September 24th between 8:12 and 8:20. In 2015 the vernal equinox can be observed March 20th between 7:32 and 7:40.